In mortgage terms, to “finance” means to borrow money from a bank or private party to partially, or completely, pay back the cost of property. To partially borrow money is to make a down payment with money you already have. The rest of the cost of the property is financed. To completely borrow money is to take a loan for the entire amount of the property. To counter the risk in taking a loan for the bank or private party, they are entitled to partial ownership until the property is pain-in-full. There are three main types of refinancing mortgages: rate-and-term, cash-out, and cash-in. Review the three types of refinancing options to see which best suit you. Rate-and-term refinance only differs from the original loan in either mortgage rate, the loan term, or both may be adjusted. An example of rate-and-term refinance would be an individual who refinances from an original 30-year fixed rate mortgage to a 15-year fixed rate mortgage. Another example would be where a homeowner adjusts there 30-year, 6 percent mortgage to a new 30-year, percent mortgage. The next type of refinance mortgage is cash-out refinance. In a cash-out refinance the new mortgage may feature a lower rate than the original loan, or a shorter term in years. The defining characteristic of a cash-out mortgage is that the loan balance is larger than the original mortgage by 5 percent or more. Cash-out mortgages can also be used to consolidate first and second mortgages when the second mortgage was not taken at the time of purchase. The downside of cash-out mortgages to the lender is that it carries more risk for them. To counter this risk, there are stricter approval standards, and lower amounts allowed to lend. The last type of refinance mortgage is cash-in refinance. Cash-in refinance mortgages, are the exact opposite of the cash-out refinance. With cash-in refinance, a refinancing homeowner brings cash to closing in order to pay down the load balance and the amount owed to the lender. The cash-in refinance usually results in a lower rate, shorter term, or both. There are several reasons a homeowner may opt for cash-in refinance mortgages. The most common reason is to get access to lower mortgages rates which may only be available at a lower loan-to-value. 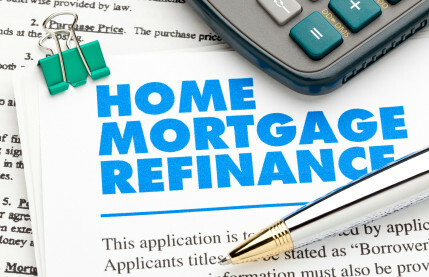 Because of refinancing options, most refinances will require re-verification of the borrower. Since the refinance is establishing a new loan with new terms, applicants are typically reviewed again to receive approval that they are still eligible for the loan. The first area of the borrow that is checked again is their credit score and payment history. This is to insure that they have no outstanding payments that have not been paid over an extreme period of time. The next aspect that is reviewed is their income and employment history. Income is a good assurance for the lender to know the borrower can sustain payments. Without current employment, it is very difficult to receive a loan originally and a refinance option. Lastly, the retirement assets and cash reserves are checked to see what the borrower is left with if they are laid off from their current job and are not able to have an income coming in. As well as the three areas to be checked, a home appraisal is usually required to determine the current market value of the home. In contrast to verification loans, no-verification refinance mortgages exist as well. There are four main refinance programs that do not require verifications. All of these programs are called streamline refinances. Different lenders may deploy different overlays for each of the streamlined programs, but the programs can be summarized as follows. The first is the FHA Streamline Refinance. This is available to homeowners with an existing FHA mortgage. It waives all verifications and refinance mortgage rates are as low as with a standard-verification FHA-backed loan. Some households get access to a reduced mortgage insurance premium through this method. Cash-out refinance mortgages are not allowed to take on the FHA Streamline Refinance program. The next method of the streamline process is the VA Streamline Refinance. This option is available to homeowners with an existing VA-backed mortgage. This is officially known as the VA Interest Rate Reduction Refinancing Loan (IRRRL). This option waives the income, asset, and credit score verifications. The VA homeowners are required to demonstrate that the mortgage will result in monthly payment saving, except for shorter loan term options. Cash-out is not available in this refinance package as well. The third option of the streamline refinance packages is the HARP Loan. The HARP is a government-backed refinance program good through December 31, 2015. It is officially called the Home Affordable Refinance Program. In order to qualify for the HARP, homeowners must have a mortgage backed by Fannie Mae or Freddic Mac, which predates June 2009; they must show a 6-month history of on-time payments; and may not have already used the HARP loan to refinance before. HARP loans do not allow cash-out to the homeowners. The USDA Streamline Refinance Program is the last of the four streamline processes. The USDA Streamline Refinance Program is available to homeowners with existing USDA home loans. USDA loans are for homeowners in rural or suburban areas which allow for up to 100% financing. The USDA Streamline Refinance Program does not verify income, assets, or credit score; and, homeowners using the program are limited to a 30-year fixed mortgage rate until mid-October 2015. After that time, the program will expand to allow 15-year loan terms as well. Cash-out refinance mortgages are not allowed for the USDA refinance, just like the other three.